PDP considers legal action against asset seizure Executive Order – Royal Times of Nigeria. 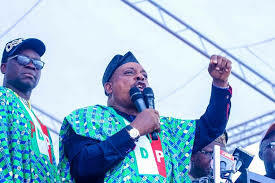 The Peoples Democratic Party (PDP) has condemned as illegal, unconstitutional, reprehensible and a dangerous step towards fascism, the Federal Government’s Asset Seizure Executive Order, which authorizes seizure of assets suspected to be acquired with stolen funds. President Muhammadu Buhari signed the order which seeks to deny suspects access to assets seized by agencies investigating them. In a statement issued by its National Publicity Secretary, Kola Ologbondiyan, the opposition party noted that the Nigerian constitution did not, under any section, confer such fascist powers on the President under the nations democracy. It said the President intends to hijack the lawmakers’ power so that he can use it as a political instrument, to haunt, traumatise, harass and victimise perceived political opponents. 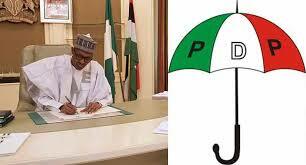 While stating that it is not opposed to the fight against corruption, the PDP said the imposition of this Executive Order is totally unacceptable. The PDP therefore charges the judiciary and the legislature to save Nigeria from an imminent fascism by rejecting this obnoxious Executive Order, adding that it is considering a legal action against President Buhari for the order.